Amazon.com description: Product Description: Jeremiah Curtin was an American born translator and folklorist. 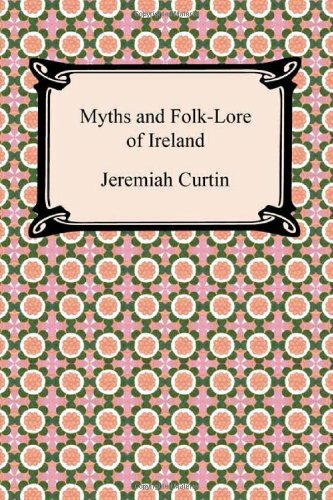 In "Myths and Folk-Lore of Ireland" Curtin turns his attention to the tales of the island nation of Ireland. In this collection you will find the following tales: The Son of the King of Erin and the Giant of Loch Lein, The Three Daughters of King O'Hara, The Weaver's Don and the Giant of the White Hill, Fair, Brown and Trembling, The King of Erin and the Queen of the Lonesome Island, The Shee an Gannon and the Grugach Gaire, The Three Daughters of the King of the East and the Son of a King in Erin, The Fisherman's Son and the Grugach of Tricks, The Thirteenth Son of the King of Erin, Kil Arthur, Shaking-Head, Birth of Fin MacCumhail, Fin MacCumhail and the Fenians of Erin in the Castle of Fear Dubh, Fin MacCumhail and the Knight of the Full Axe, Gilla na Grakin and Fin MacCumhail, Fin MacCumhail, The Seven Brothers and the King of France, Black, Brown and Gray, Fin MacCumhail and the Son of the King of Alba, Cuculin, and Oisin in Tir Na N-Og. About: Jeremiah Curtin (September 6, 1835 – December 14, 1906) was an American translator and folklorist.